Earl Peterson (1927-1971) travelled in January 1954 from Michigan to Memphis to ask for an audition at the Sun Studios and recorded four songs and then moved on. He knew Sam Phillips from the time he was a disc-jockey. He was impressed by the song Boogie Blues. 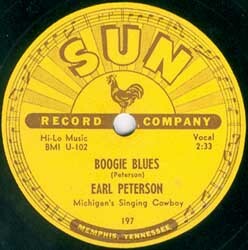 It wasn’t a hit (it sold 2672 copies) and Earl Peterson re-recorded it later in the year for Columbia. And it’s difficult to find any other information about him. You can find the song on different Sun Records compilations.